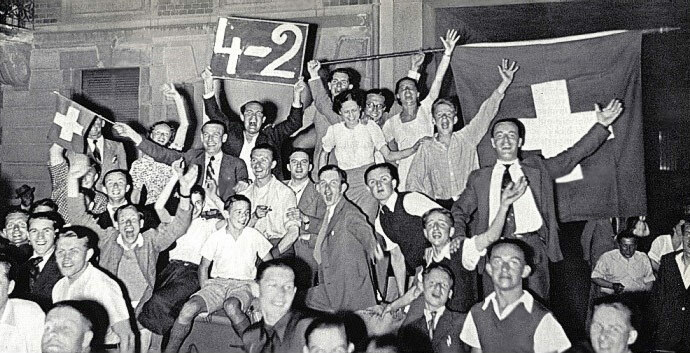 Cheering crowd in Zurich after the 4-2 victory of the national football team over Greater Germany, 9 June 1938. In the round before the quarterfinal the Swiss (coached by Austrian Karl Rappan) kicked the Germans out of the Football World Championships in Paris. Because of its political symbolism and worldwide publicity, this victory is still considered as one of the greatest of the Swiss national team. For the German national team this game was the last one in an international tournament until 1954. Ironically, it was again the Swiss team who was its first adversary after the war. In 1951 Switzerland broke without permission an international ban against German football and thus made possible the comeback of Germany into the international football arena.